History meets fiction and royal family history in this post. A clue to the link is the word ‘vampire’ which first entered the English language in 1732. Any idea yet who the surprising connection might be? 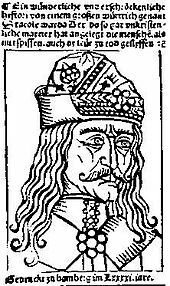 Vlad III was born in 1431. In 1442 he was handed over to the Turks along with a brother as a hostage. Five years later Vlad’s oldest brother took up arms against the Turks and his father – Dracul- made a treaty with the Hungarians. There wasn’t a happy ending. Dracul was beheaded by the Hungarians and his eldest son was murdered. It would have to be said that starving Richard II to death in Pontefract Castle or inserting red hot pokers into the royal personage of Edward II seems fairly mild in comparison to the end of Dracul’s son. His eyes were put out and he was buried alive. The Turks took the opportunity to send young Vlad home where he attempted to seize the throne. He ruled for a short time but when he lost his army he was forced to flee to Moldavia. And that might have been the story of Vlad, son of Dracul except for one thing. In 1453 Constantinople fell to the Ottomans. Vlad was able to make a treaty with Hungary and in 1456- the year of a comet- he took back his throne. During the next decade he came to be known as Vlad Tepes. Tepes means impaler and he ruled Wallachia (modern day Romania) and bits of Moldavia. The name gives a clue as to how he turned a lawless border kingdom into a model of good behaviour (possibly heavily tinged with overtones of terror). Legend has it that Vlad had a gold cup put by a well in Targoviste so that ordinary people could draw water and drink. It was stolen. When the thief was tracked down, Vlad had the thief’s family impaled. The second time the cup was stolen the thief’s family handed the foolish thief straight over to Vlad. The cup wasn’t stolen for a third time. He founded the Order of the Dragon to fight infidels and heretics. In fact, he spent most of his reign campaigning against the Ottoman Empire which was seeking to expand into the Balkans during this time. He also sought to improve trading opportunities for his own citizens. His methods weren’t terribly subtle. One of the more memorable strategies involved…impaling. He is famous, or perhaps infamous for impaling people prior to enjoying a hearty breakfast and also for nailing ambassadoral hats to ambassadorial heads. In fact, one way and another he put a whole new meaning on the word head count. And the surprising link? Well, the Queen can allegedly trace her lineage back to Vlad the Impaler’s half-brother through her grandmother Queen Mary. This entry was posted in surprising connections and tagged Dracula, Ottoman Empire, Vlad the Impaler by JuliaH. Bookmark the permalink. That is a surprising connection JuliaH! It certainly is unexpected. I came across it when I taught a course entitled ‘Villains in History’ for the WEA (Workers’ Educational Association). That sounds like a fun course to teach!